We’ve just released an extension for the Google Chrome web browser that makes it easy to add bookmarks and news feeds to your Protopage. Simply click the icon and the extension will show you if the news site or blog you are currently visiting can be added to Protopage as a news feed. 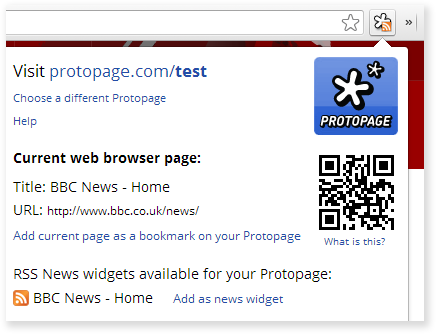 It’s also an easy way to add bookmarks to your Protopage. We’re also working on a Firefox extension for future release. This entry was posted on Wednesday, February 13th, 2013 at 2:01 pm	and is filed under new features. You can follow any responses to this entry through the RSS 2.0 feed. Both comments and pings are currently closed. Frankly, I don\\\’t see the purpose of this Chrome extension. My main Protopage gives me the access to what I want. It’s not designed as a replacement to Protopage, it’s simply an easy way to add bookmarks and feeds to your existing Protopage.